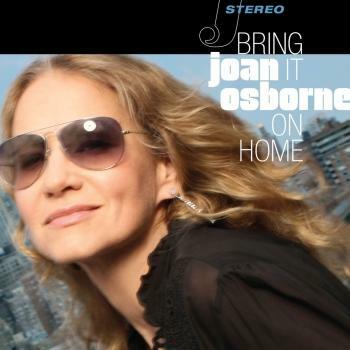 "Bring It On Home" is Osborne's first album of hand-picked vintage blues and soul songs, a collection that fans have long been asking for and Osborne herself delighted in making. Drawing from a voice the New York Times called "angelic ecstasy" and "sexual abandon," Joan Osborne created a special collection of some of her favorite classics, a personal tribute to the music she has long loved and drew inspiration from. With vocals that growl and soar, Osborne alternately cries out with heart-wrenching soul and foot-stomping grooves. She personally selected the obscure gem "Roll Like A Big Wheel" from her own record collection and added rock n roll-fueled urgency to it. She also dug deep into John Mayall's work and came back with "Broken Wings," where her vocal performance draws both goose bumps and tears. The often overlooked Ike Turner-penned "Game of Love" was another treasure Osborne chose to record, and during the sessions an impromptu rendition of "Shake Your Hips" made its way onto the album. "Bring It On Home" also includes tracks originally made famous by American blues masters such as Sonny Boy Williamson ("Bring it on Home"), Muddy Waters ("I Want to Be Loved"), as well as recordings originally released by some of the greatest R&B singers ever including Ray Charles ("I Don t Need No Doctor"), Al Green ("Rhymes") and Otis Redding ("Champagne and Wine").